Data from a recent study on the present state of the automotive industry found that 21-37 percent of car owners regard self-driving car technology as an important feature to consider towards their next car purchase. Pansop conducted this study using U.S. consumer survey data to show the importance of self-driving features. In the survey, people expressed the importance of features such as lane assist, self-parking, and self-driving on the highway as factors to consider towards to their next car purchase. In consideration of the current state of the automotive industry, having 21-37 percent of consumers rate self-driving technology as important for their very next car purchase is substantial. Currently, there is a limited amount of self-driving features available for the average consumer but the data would suggest that consumers are aware of such features and that they take them into practical consideration. The following is a graph that compares how people ranked self-driving car features are to them based on levels of importance. 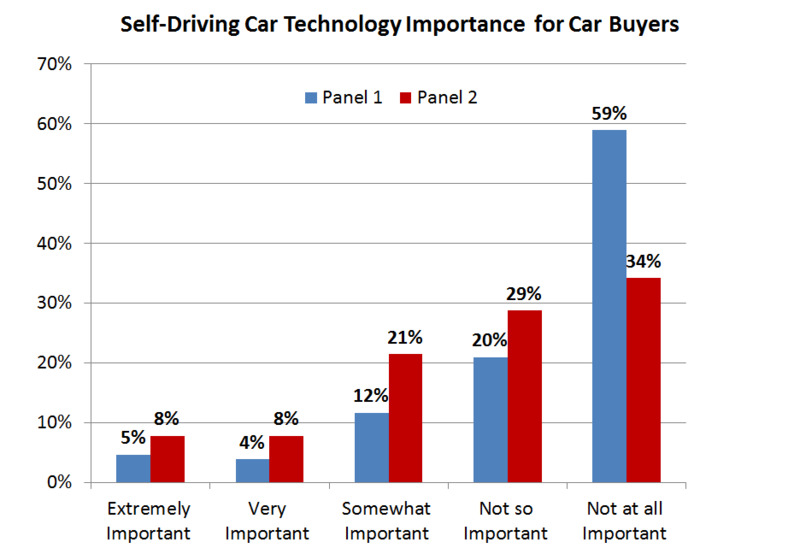 While the prospect of self-driving cars is a game-changing feature in the long-term future of the industry, this study also found that the majority of the respondents (approximately 34 - 59 percent) feel that self-driving features are not important for their very next car purchase. Such figures may not be too surprising to the automobile companies who plan to enable additional features in their cars in the next 2-3 years. Pansop conducted this study using two separate online panel surveys which include slightly different wordings in the questions. The surveys were produced in efforts to better understand U.S. consumer attitudes towards the demand for self-driving features in a car. The demand for self-driving features has potential to impact the stocks of companies that benefit from an increased adoption of self-driving technology.